With cutthroat competitions and vying markets, it is hard for many to come out on top in the corporate world. For people of color, the struggle is even fiercer. The percentage of senior level positions held by black men is staggeringly low at 1.6 percent, and the percentage held by black women is even lower, at 1.5 percent, according to a 2016 Fortune article. Morgan DeBaun, CEO and the founder of Blavity, shared the story of her journey creating the online media company and her experience as an African-American entrepreneur in Silicon Valley with Boston University students at Friday’s fireside chat, co-hosted by BU’s Questrom School of Business, BU’s Dean of Students Office, and a nonprofit called Next Wave in Business. Launched in July of 2014, Blavity, an online media platform tailored to black millennials, is one of the fastest growing media companies, with seven million total subscribers. On their website, Blavity offers users content ranging from news to original videos. Now, the company owns five separate brands including Blavity, 21 Ninety, Afrotech, Travel Noire and Shadow and Act. DeBaun met her future co-founders Aaron Samuels, Jonathan Jackson and Jeff Nelson at their alma mater, Washington University in St. Louis. It was there the name Blavity came into being, combining the words “black” and “gravity.” After moving to California, DeBaun said, she was inspired to use her experience connecting with others to make something of her own. Nadiyah Humber, a Questrom professor and civil attorney, said she often calls racial bias in the workplace “discrimination with a smile” due to its less overt presentation. 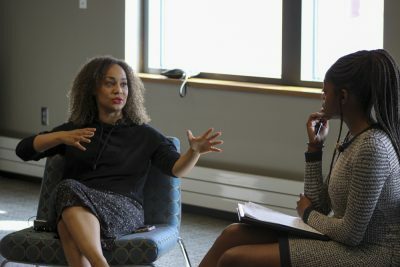 Despite how low the number of people of color in executive-level positions remains, Humber said, she’s optimistic about the people, like DeBaun, who are currently in those positions. DeBaun’s journey to Silicon Valley to launch and realize her dream is something Humber said she hopes might inspire other people of color who aspire to work in the tech world. To tech-hopefuls, DeBaun offered words of encouragement, telling them to make their dreams come to life and not let obstacles, racial or otherwise, hold them back.